Joan Maloof founded the Old-Growth Forest Network to preserve, protect and promote the country’s few remaining stands of old-growth forests. She is an ecologist, conservationist and writer with a unique voice. Professor Emeritus of Biological Sciences and Environmental Studies at Salisbury (Md.) University, D. Maloof has studied and worked with plants all her life. 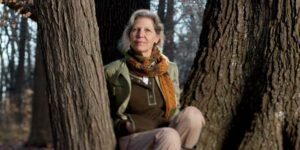 She has published numerous research articles and written several books, including “Nature’s Temples: the Complex World of Old Growth Forests” (2016) and “The Living Forest: A Visual Journey into the Heart of the Woods” (2017). The free-of-charge presentation will be followed by a reception. Follow the signs from the Lancaster Ave. entrance for ample parking in the visitors’ lot on the Haverford College campus. The annual event is co-sponsored by the Haverford College Arboretum Association, the Hardy Plant Society/Mid-Atlantic Group and the Henry Foundation for Botanical Research.